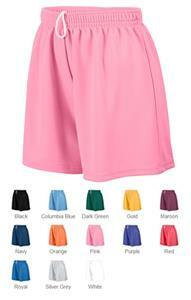 Augusta Sportswear Girls' Wicking Mesh Short. 100% polyester wicking mesh. Wicks moisture away from the body. Girls' fit. Covered elastic waistband with inside drawcord. Double-needle hemmed bottom. Waist (on half) 10 3/4" 11 1/4" 11 3/4"
Hip (on half) 17 1/2" 19 1/2" 21 1/2"
Inseam 3 1/2" 4" 4 1/2"
A bit thin and see-through. Daughter doesn't seem to mind as her underwear remains discreet.